AtoM has the ability to act as a data provider to service providers interested in harvesting descriptive metadata from AtoM, by exposing simple Dublin Core XML via OAI-PMH, the Open Archives Initiative Protocol for Metadata Harvesting (version 2.0). Below you will find basic information on how to enable AtoM’s OAI plugin, how to set up AtoM’s OAI repository parameters, and some basic examples of requests and responses using the OAI-PMH verbs supported by AtoM. Before being able to expose metadata to a harvester request, the arOaiPlugin must be enabled. You must be logged in as an administrator to manage plugin settings. To enable the OAI plugin, navigate via the main menu to Admin > Plugins. AtoM will redirect you to the Plugins page. Ensure that the checkbox next to the arOaiPlugin is checked - if it is not, check the box and then save the change using the Save button located in the button block at the bottom of the page. After enabling the OAI plugin, you will want to make sure that you have properly configured AtoM’s OAI repository settings. The settings for AtoM’s OAI repository are maintained in Admin > Settings > OAI repository. You must be logged into AtoM as an administrator to access these settings. A brief explanation of each field in the OAI repository settings page is included below. To configure the settings, navigate via the main menu to Admin > Settings. AtoM will redirect you to the Settings page. Select the “OAI repository” link in the menu on the left side of the page, and AtoM will load the OAI repository settings. You can now make changes to configure your the OAI repository in AtoM. Remember to save your changes when complete, using the button block located at the bottom of the page. A boolean value (e.g. true [yes] or false [no]) that determines if requests will be accepted from any harvester, or if only those requests which include an authorized API key will receive responses. 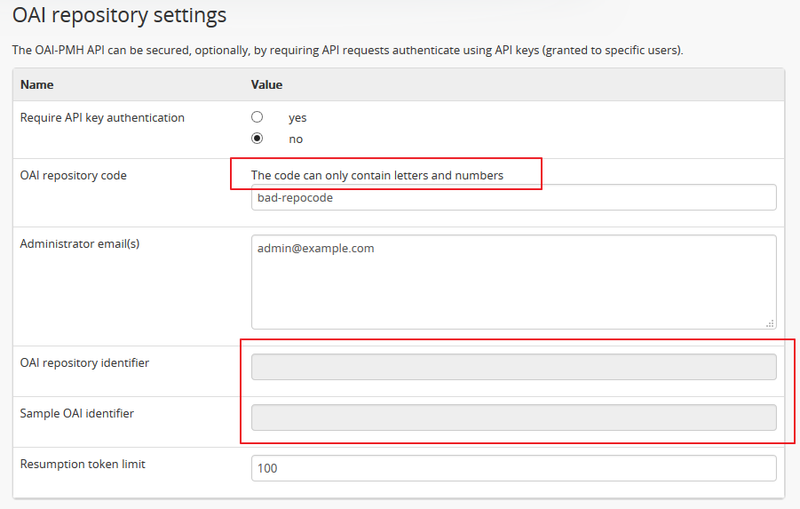 Instructions on how to configure an API key per AtoM user account are included below - see: Set AtoM to require an API key for OAI-PMH requests. The default setting in AtoM is “no” - meaning if you have enabled the OAI plugin, any harvester can make requests to AtoM. The API key setting allows an administrator to enable the OAI repository in AtoM, while restricting responses to requests that include a valid API key in the HTTP header of the request. An alpha-numeric code can be added in the value field to uniquely identify this particular OAI repository within its network domain to create a unqiue, OAI compliant identifier. The value of the repository code will be combined with the base URL of your AtoM site to construct the OAI repository identifier. The OAI-PMH specification notes that at least one repository administrator’s email address should be included as part of a response to an Identify request. This field allows an administrator to enter one or more email addresses which will be included as part of AtoM’s response. Multiple email addresses can be entered in this free-text field, separated by commas. See the Identify example response below to see how they are typically returned in a response to an Identify request. AtoM does not currently enforce any validation on this field - that is, AtoM does not force you to populate this field with any values, and email addresses are not checked for accuracy before being inserted into a response. Make sure you double-check that you’ve input your email addresses correctly! This is an auto-generated setting that produces an OAI compliant repository identifier, which includes OAI repository code value if it is set. The repository identifier is a combination of the base URL for your AtoM site, and the repository code entered in the field above, separated by a colon. This is an example of the auto-generated, OAI compliant identifier which is created for each item in this particular OAI repository. The sample OAI identifer is returned as part of the response to an OAI Identify request submitted by a harvester. This relates to the number of entities to include in a single OAI response list before inserting a resumption token. The default setting in AtoM is 100 (e.g. 100 identifiers would be returned in response to a List identifiers request from a harvester, before a resumption token would be issued and the request terminated). Setting a resumption token limit avoids the possibility that large requests (such as List records) will time out the system. When the resumption token limit is reached, AtoM will end the response with a resumption token. A harvester can then use the resumption token to submit a new request that continues where the previous one terminated. Setting this value too high can result in performance issues, as AtoM may time out during the response to a request. We recommend keeping this value at 100 or lower. This setting allows AtoM to expose “virtual sets.” Currently in AtoM, each archival unit (e.g. a description and all its children, such as a fonds, collection, etc) is considered a set and is given a <setSpec> value when responding to requests such as List sets or List records. However, thanks to the flexible nature of OAI-PMH, AtoM can also expose virtual sets, representing different groupings of records or different criteria for exposure. At present, the only supported additional or “virtual” set in AtoM is a virtual set that will only expose top-level descriptions (i.e. no children will be included in the response). We hope to add further additional sets in future versions of AtoM. The virtual sets available in AtoM can also be seen as part of the response to a List sets request. See the OAI-PMH verbs in AtoM section below for further examples. As of version 2.2, AtoM now has a setting that allows an administrator to restrict OAI exposure to only respond to requests that include a valid API key. The default setting in AtoM is “no” - meaning if you have enabled the OAI plugin, any harvester can make requests to AtoM, and users can view OAI responses in their browsers by manipulating a URL to include an OAI request. Once enabled, OAI requests must pass a valid API key in the HTTP header. Requests that do not pass a valid API key will return a 403 Forbidden HTTP status response. 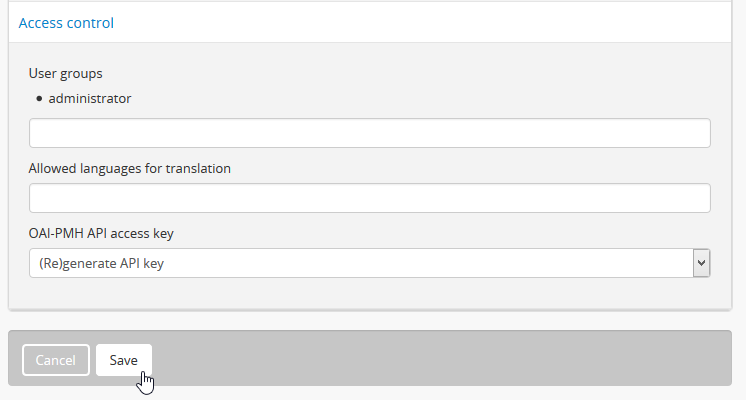 Navigate to Admin > Users via the main menu, and find the user account for which you would like to generate an API key. Click the Edit button located in the button block of the user’s Profile page. For more information on managing user acccounts, see: Manage user accounts and user groups, specifically: Edit an existing user. Using the drop-down, select the “(Re)generate API key” option, and then click the “Save” button located in the button block at the bottom of the edit page. AtoM will reload the page in view mode. You will see an API key value included (in red) on the user’s profile view page. You can repeat steps 1-4 for as many users as are required.You can also regenerate a new key at any time by following steps 1-4 above. To delete a key, follow steps 1-2, and then select “Delete API key” from the drop-down menu described in step 3. When you click “Save” in the button block of the edit page, AtoM will reload and display the user’s profile in view mode without an API key. 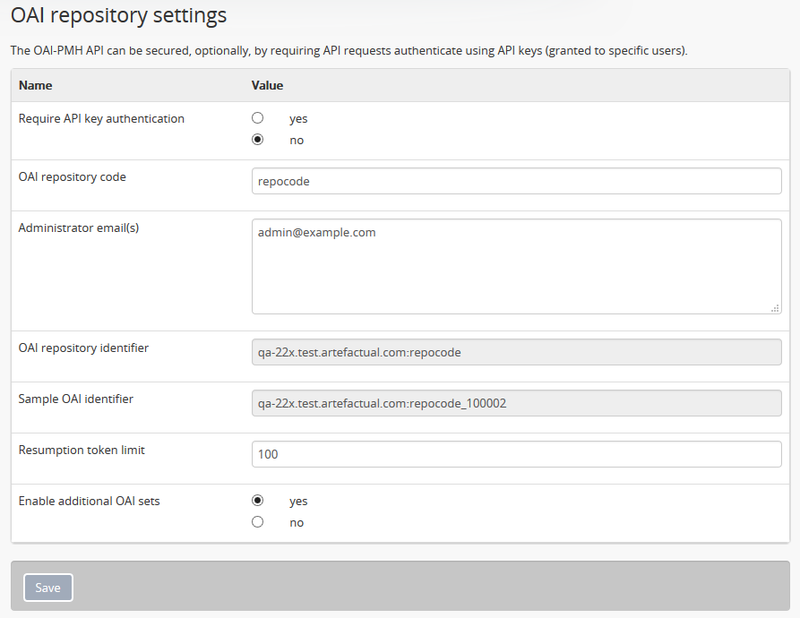 Once you have API keys generated for the necessary user accounts, you can now enable the OAI repository setting so that an API key will be required as part of a request. To do so, navigate to Admin > Settings > OAI repository and make sure the radio button next to the field labelled ” Require API key authentication” is set to “Yes.” Save your changes by clicking the “Save” button in the button block at the bottom of the OAI repository settings page. For further guidance on managing OAI repository settings, see the section above, Configure AtoM’s OAI repository settings. Now a valid API key must be included as part of the HTTP header in a OAI request for AtoM to return a response - otherwise a 403 Forbidden HTTP status will be returned instead. curl -v -H "X-OAI-API-Key: caaac1a110b771bf" "http://example-site.com/;oai?verb=Identify"
Note that without a browser extension that would allow additional information (such as the API key) to be passed in the HTTP header, enabling the API key requirement in the settings means that users will no longer be able submit OAI requests by directly manipulating the URL in the browser. This verb is used to retrieve information about a repository. This verb is used to list the metadata formats that can be disseminated from the repository. At this time, only Dublin Core (oai_dc) XML is currently available. The response shows that the repository supports one metadata format: oai_dc. For each of the formats returned by such a request, the location of an XML Schema describing the format should be given. The support of these formats at the repository-level does not imply support of each format for each item of the repository. This verb is an abbreviated form of ListRecords, retrieving only headers rather than records. Optional arguments permit selective harvesting of headers based on set membership and/or datestamp. The metadataPrefix is a required argument as part of the request. from - optional - parameter entered as UTCdatetime value, which specifies a lower bound for datestamp-based selective harvesting. until - optional - parameter entered as UTCdatetime value, which specifies an upper bound for datestamp-based selective harvesting. metadataPrefix - required - must be oai_dc (not required if resuming a truncated request - see resumptionToken, below). resumptionToken - exclusive - used to continue a request that was truncated. Value is a token supplied as part of the previous incomplete request. If you have previously passed other arguments (such as the metadataPrefix, or from/until parameters), they should not be included in the continued request - only the verb, and the resumptionToken argument and token should be included. A resumption token is included in the example. Specifies a lower or upper bound for datestamp-based selective harvesting. Both parameters can be used together if needed to target a particular range. The earliest date stamp associated with the records available from the repsository is included in a typical Identify response. See above, Identify. This verb is used to harvest records from a repository. Optional arguments permit selective harvesting of records based on set membership and/or datestamp. The metadataPrefix is a required argument as part of the request. set - optional argument with a setSpec value , which specifies set criteria for selective harvesting. resumptionToken - exlusive - used to continue a request that was truncated. Value is a token supplied as part of the previous incomplete request. If you have previously passed other arguments (such as the metadataPrefix, or from/until parameters), they should not be included in the continued request - only the verb, and the resumptionToken argument and token should be included. If you have enabled the “Additional sets” setting, (see above Configure AtoM’s OAI repository settings), a virtual set parameter could also be used. See the List identifiers examples above for guidance on using some of the additional arguments, such as from, until, and the resumptionToken. See the Get record response for examples of how AtoM can pass URLs to linked digital objects via OAI. This verb is used to retrieve an individual metadata record from a repository. Required arguments specify the identifier of the item from which the record is requested and the format of the metadata that should be included in the record. identifier- required - specifies the unique identifier of the item in the repository from which the record must be disseminated. A list of identifiers can be retrieved using the ListIdentifiers request. metadataPrefix - required specifies the metadataPrefix of the format that should be included in the metadata part of the returned record. The metadata formats supported by a repository and for a particular record can be retrieved using the ListMetadataFormats request. This verb is used to retrieve the set structure of a repository, useful for selective harvesting. For a long request (e.g. a repository with many sets), a resumption token may be supplied - the resumptionToken is the only parameter supported by this verb. Note that available virtual sets, including the setName and setSpec, will also be included in a List sets response. The example response below includes a virtual set example. For more information, see the Configure AtoM’s OAI repository settings section above. resumptionToken - exclusive - used to continue a request that was truncated. Value is a token supplied as part of the previous incomplete request. If you have previously passed other arguments (such as the metadataPrefix, or from/until parameters), they should not be included in the continued request - only the verb and the resumptionToken argument and token should be included.